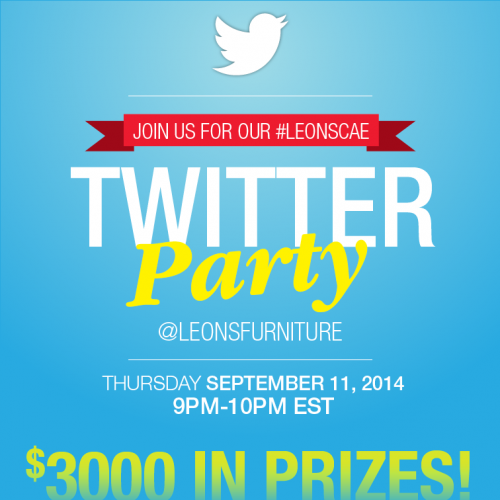 Home » Blogs » Leon’s Furniture is Having A Customer Appreciation Event! Join Our Twitter Party! Leon’s is one of Canada’s largest retailers, selling a wide range of merchandise including furniture, major appliances and home electronics. The company continues to be run by the Leon family and maintains the standards of service, integrity and dedication established by Ablan Leon over 100 years ago. Leon’s Furniture Limited has grown to become one of Canada’s most highly respected retailers and an integral part of Canadian Homes. Leon’s customers are being celebrated with over $3000.00 in prize giveaways! Have you RSVP’ed for the biggest Twitter Party of the year??? Click HERE are all of the details! Make sure that you RSVP for the chance to win one of the amazing prizes being given away. The most important thing to know is the date. September 11th 2014 at 9pm-10pm EST. Follow Leon’s on Twitter along with moderator She’s Connected. Join Us for the chance to WIN!! !